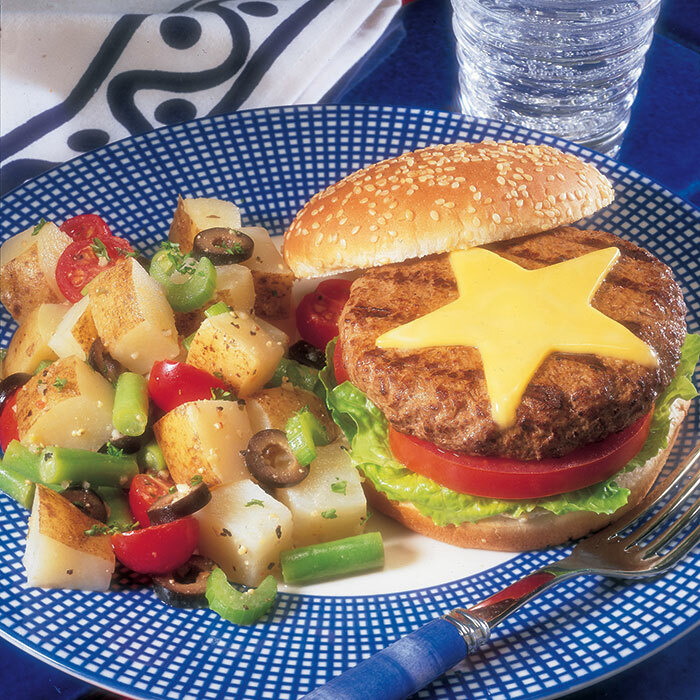 Celebrate Memorial Day, the 4th of July or the weekend by putting these classic All-American cheeseburgers on your grill! Combine mayonnaise and mustard. Cut star shapes from cheese with cookie cutter. Lightly shape ground beef into eight 1/2-inch thick patties. Place patties on grid over medium, ash-covered coals. Grill, covered, 8 to 10 minutes (over medium heat on preheated gas grill, covered, 7 to 9 minutes) until instant-read thermometer inserted horizontally into center registers 160° F, turning occasionally. Season with salt and pepper after turning. About 1 minute before burgers are done, top with cheese stars. Serve in buns with sauce, lettuce and tomato.